The Warm Springs is filled with the warm tones of orange, peach and red. 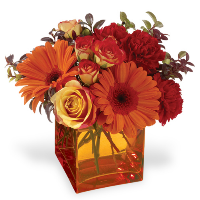 The contemporary design comes in a glass square vase. Clear glass may be substituted for the color shown depending on availability.